It’s going to be an exciting summer. There is tremendous research happening around the world attempting to bridge the gap between computational fields such as artificial intelligence, constraint programming, optimization and machine learning with scientists carrying out research in fields such as ecology, sustainability, climate systems, power planning. 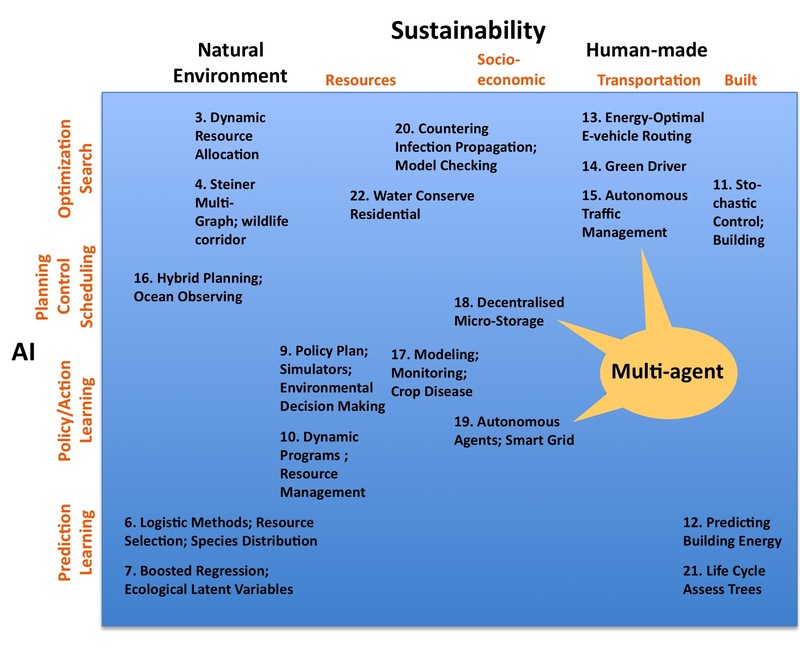 This collaborative research goes under many different names such as Computational Sustainability, Ecosystem Informatics, Sustainable Computing and Climate Informatics but they all share the idea that there is enormous potential sitting at the intersection between the latest computational research and the effort to improve the sustainability of human society in the broadest possible sense. In an effort to get this blog kickstarted I thought I’d write the itinerary for some very ambitious CompSust researcher who wanted to see it all over the summer. (Although I suppose you should be sure to buy lots of carbon offsets…) If there are others I’m missing (likely), feel free to let me know in the comments. The first stop would have been a few weeks ago in San Diego at the International Green Computing Conference which looked at both sides of the Computing/Sustainability coin by bringing together researchers in the “fields of sustainable and energy-efficient computing, and computing for a more sustainable planet”. Next up, you could head over to Edinburgh for ICML2012 at the end of June. ICML will have some focus on machine learning for sustainability including an invited talk by David MacKay on using machine learning to make sure the challenges of climate change and sustainable energy management are faced head on with reliable numbers. The following week, it’s a short hop over to Copenhagen, Denmark for Computational Sustainability 2012 which starts with a day of Master Class Seminars by leaders in the field on existing results and problem domains followed by two days of the latest research. The schedule isn’t out yet but the topics promise to include research on computational approaches to land use planning, climate modelling and natural resource and energy planning. AAAI2012 is in Toronto this year and once again running a special track on Computational Sustainability. A brief look at the sustainability topics includes: modelling climate change, ocean eddy monitoring, air pollution, forest management, wildlife conservation design, invasive species and infectious disease control, power grid management and battery output prediction and control. Just from the titles the range of computational methods used includes at least : linear programming, Q-learning, Lagrangian relaxation, Inverse RL and Bayesian ensemble prediction. In September you could then head over to Boulder, Colorado for the Climate Informatics 2012 conference which will bring together researchers in machine learning working specifically on the problems of climate modelling. Part of the focus is to brainstorm ideas on how to accelerate progress on climate change questions as well as discover challenging new domains to push existing machine learning approaches. Finally in October (ok, this is well out of the summer, but still) there is the International Workshop on Constraint Reasoning and Optimization for Computational Sustainability (CROCS-12) in Quebec City. You even still have time to submit for that one, Quebec City should be very nice in October…before the snow comes. Some other events can also be found on the CompSust page at the CRA. I’m planning on writing up some highlights from the CompSust2012 and AAAI conferences this summer so if there is something fantastic you see there, at another conference or elsewhere let us know in the comments.